The Sandman Chronicles: Design Walk 2009! 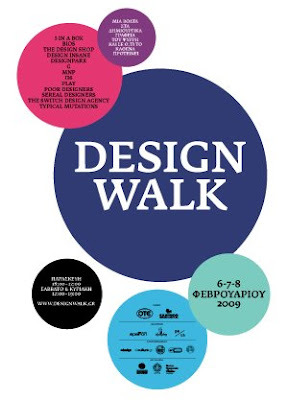 Tomorrow starts one of the biggest annual events in Greek design, Design Walk. Although it is a walk we are used to taking, nobody would call it a usual walk. In the course of three days, Design Walk allows us to familiarize ourselves with the graphic design scene of Athens (particularly the studios located around Psyrri area) through a series of exhibitions and happenings. The events hosted in the studios attempt to discuss and showcase the various aspects of design. The idea emerged three years ago when three design studios (pi6, g and the design shop) were striving to stir things up a bit in the local design scene and has ever since gained through its innovative spirit an overwhelming and ever increasing response from a diverse audience. Every year the city centre is filled with people wandering around, holding maps, and drawing their routes between the creative studios. You can download the map here. Design Walk has become an essential part of the beginning of the year calendar. The 13 participating studios are members of a new generation of graphic designers who, having become aware of the role of design as an expanded platform of communication, invite a wide variety of people to take part in a dynamic and productive dialogue. The main aim is to challenge standard preconceptions about design and provide with the ground for exploration in a field that is becoming more and more essential to our everyday life. Lets not forget that through design we communicate, get informed, learn, find or lose our way. Pi6 - Ready or not, here I come! I will be there and report back next week with all the brilliant stuff and people I will see! If you are in Athens this weekend, do not miss this! ωχ τελειώνει αύριο??? να πάρει και δεν με βλέπω να προλαβαίνω να το δώ. καλησπέρα και καλώς σε βρήκα. καλώς ήρθες!!! Αν δε το πρόλαβες κρίμα, θα πάρεις μια γεύση από το σχετικό ποστ σύντομα! Είχαν όντως πρόβλημα, κάτι μου έκανε το blogger, τα διόρθωσα όμως! πολύ στο ψιλό δε με πήρατε για το παιδί μου??? Υ.Γ. εγώ τώρα γιατί χαίρομαι? είμαι πολύ χάλια, γιατρέ μου? @MenieK: είσαι αλλά δε το κάνουμε θέμα γιατί σε αγαπάμε και είσαι φίλη μας! Award for stand design at Infacoma 2009!